Hey everyone! Hope you had a great weekend – I’m back in the USA having a blast on tour w/Foreigner. However, I’m starting to get really excited about our War & Peace release, especially after seeing the cool new shirts we ordered just for you guys! Just a quick reminder… many of you expressed interest in a WAR & PEACE shirt so we ordered a limited run, so go get em while they last! 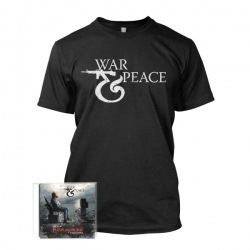 Go check out the W&P store at http://www.indiemerch.com/warandpeace and place your orders now if you want to receive your shirt and/or CD before or on the day of release, April 23. We have exclusive doubled-sided shirt & CD (signed by Me!) bundles as well as signed CDs (which can be ordered as a stand alone item). Small and extra large shirts are really limited so get yours before they’re gone! Ok, enough pitching – just no bitching if you wait and it’s too late… Hey, there could be a song here! Hey Everyone – we’re getting pumped up about our new re-release of the War & Peace Flesh & Blood Sessions! I hope you’ll dig the new bonus track we added, but to make sure we add a little more to the mix, check out our new Indie Merch site for a CD+Shirt deal! I’m told supplies are limited, so that means if you are a small or XXL you might want to buy quickly… don’t say I didn’t warn you! And don’t forget to keep promoting this on your social media sites – things have slowed down in the last week and I want to see our “street team” pushing hard to get the word out, loud & proud! And I still plan on picking a few “winners” from our contest the week prior to send an autographed CD+shirt as a sincere “THANX” for all you do to help me keep this music alive. On April 23, Deadline Records (a division of Cleopatra Records) will release a special edition of “The Flesh And Blood Sessions” from WAR & PEACE. The collection includes an unreleased track and liner notes from Jeff Pilson. WAR & PEACE is the all-star line-up of Jeff Pilson (DOKKEN, DIO,FOREIGNER) on lead vocals and guitar, Vinny Appice (BLACK SABBATH,DIO, KILL DEVIL HILL) on drums, Michael Diamond (LEGS DIAMOND) on bass, and Randy Hansen on lead guitar. “The Flesh And Blood Sessions” contains the original 1988 studio sessions recorded at the legendary Sound City Studios by Angelo Arcuri(BLACK SABBATH, DIO, HELLION) and mixed by Neil Kernon (DOKKEN,QUEENSRŸCHE, KANSAS), as well as five tracks chiefly put together byJeff Pilson in the mid 1990s. Remastered by Wyn Davis (DOKKEN, DIO), “The Flesh And Blood Sessions” reissue comes with all new artwork, liner notes by Jeff Pilson, and includes an exclusive bonus track, “Heaven Knows”, featuring guitarist Darren Housholder (LOVE/HATE), not found on the original 1999 release. Making a guest appearance on “What I Hid Behind” isRobin McAuley, with whom Jeff was working in MSG. Jeff Pilson is a prolific musician, a multi-instrumentalist who has been in internationally-recognized bands almost his entire career. As evidenced by the musical fire power in WAR & PEACE, Pilson‘s collaborations lead to material that holds up in today’s heavy music environment. “To this day, I’m frequently asked about this period of the band and thought that putting out this CD could answer many questions,” said Jeff. “Nailed To The Cross” can be streamed at this location. Hey everyone – just a brief update on the plan for a contest. I used to love our old “street team” approach to my last two War & Peace releases where we would use message boards to get the word out with art & info for people to email, print & post all over their towns. It was cool! But today, we have a tool to help us… social media. And while I’m not always savvy to the best ways to leverage these tools, I thankfully have a friend in Michael Regan to help me with a cool fan-based contest. I’m looking for a “fan of the day” who will take the Amazon link and share it on their Facebook, G+, and Twitter pages. I’m looking for fans who really get into this, and I will do my best to randomly pick one fan each day and I will thank them on my fan page and tout what they are doing so everyone can see how much I appreciate each and every one of you who helps me share this music with more fans! On the day before the release I will pick my top 3 fans that have really gone over the top and send them a War & Peace fan pack, including a signed copy of the brand new Flesh & Blood Sessions (with new bonus track) and some goodies I’ll toss in just for fun! I really appreciate you guys getting into this, and I’m looking forward to seeing how creative you all can get with your promotions. War & Peace fans have always been an enthusiastic group, and I know this is gonna ROCK!!! Just a heads up – the W&P discs have come in from the plant and a box of CDs will come to us this week, so I was thinking… Lets set up a little contest to get the ball rolling early! We’ll run everything on our Facebook Fan Page so check back there starting tomorrow for more details! And by the way… just checked Amazon and its already listed there, including artwork, with an April 23 release date! in the spirit of our old “street teams” maybe you can throw that up on your Facebook wall or Twitter feed to help us spread the word… Thanx! !